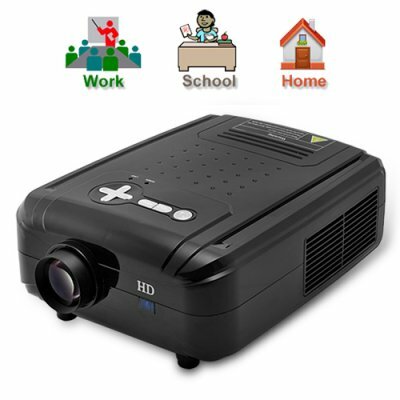 Successfully Added Acme LCD LED Projector (Office, Home, Classroom) to your Shopping Cart. The ACME LCD LED Projector is the perfect all-year, all-around projector whether your goal is to give great presentations, teach your class about Algebra, or have your friends over for some movies and popcorn. The ACME LCD LED Projector is sturdy, easy to operate, and backed by our 12 month guarantee. Attach your Sony Playstation 3 or XBOX 360 gaming system to this projector and get your game on in 120 inch gaming glory. Or attach your DVD player to this unit and charge people admission to your living room movie theater. Ever watch Neo beat the living snot out of Agent Smith in 180 inches of Matrix marvelousness??? Now you can! All the right connections... The Acme LCD LED Projector is the perfect projector for wherever you are in the world, for whatever you're doing given its amazing array of connector slots. Choose from Component AV, Composite AV, HDMI, S-Video, VGA, even SCART connections! That along with The Acme LCD LED Projector's quality visual brightness and clarity ensures you'll be projecting with success! Brought to you by the online LCD LED projector specialists at Chinavasion.com. Built in Analog TV receiver tuner!